My mom has been gone almost 20 years now. It’s been almost half of my lifetime. I graduated from college without her, got married without her, had my babies without her and I have celebrated milestones and grieved heartbreaks without her. And you know what? I still miss her. Sometimes, it’s a faint missing, like a whisper in my ear, and other times it’s as if someone punched me square in the stomach doubling me over. Some years, the anniversary of her death gets buried in the chaos of May until days later when I finally come up for air and I add another tally to the pile of years she’s been gone. Other years, grief surprises me thick and fresh, and everywhere I go the shrill scream of missing rattles in my head. Lately, life has been hard, not the regular kind of hard, but the hard that pushes in from all around until you wish you didn’t have to get out of bed in the morning, but you have to because the 5 little people you love more than life need you to chin up and be strong. I almost lost one of my little people this year. I sat by his bedside as doctors poked and prodded and begged God to wake him up. My mom wasn’t there to put her arm around me and hold me up as I wept. She hasn’t been here through the long months of joblessness that have dredged up doubt and a distorting blur of sadness. So this Spring, as Mother’s Day approached, the missing became a shrill scream from deep inside. While the world went on around me, my heart ached for her. And a few days later, on the anniversary of her death, I sat at my sweet son’s elementary school graduation and wished with a wild desperation that she knew him. Because, she would have loved him and understood him in a way that I’m not equipped to understand. But, the more I tried, the harder it got and the missing just grew. I’ve tried hard to hold it all together for my husband and my kids over this long hard year and some days I’ve done a terrible job. 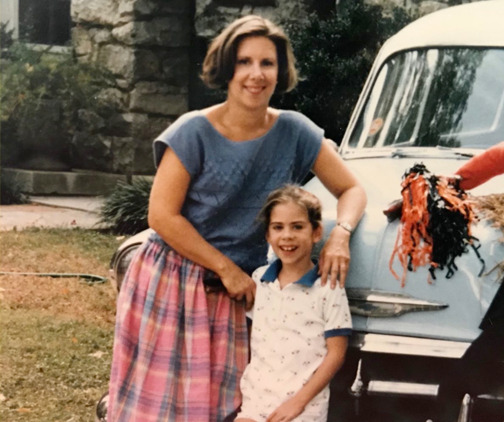 On those days, the missing has grown, because apart from my sweet, wonderful husband and some dear old friends, my mom was the one person I could be 100% percent myself with and not worry about surprising her or disappointing her. She always extended empathy before advice, a hug before a spiritual pep talk and a place to let my emotions spill out rather than coolly reasoning them away. So on the hard days, when fear creeps in and I wonder how we’ll manage to pay the next bill and discouragement threatens to steal my peace and joy, I yearn to pick up the phone and hear her gentle voice on the other end. I want to draw from the deep well of empathy that she built through her own suffering. I want her to tell me that God is good even when life is hard. I want to hear her tell me that the way I am feeling is ok and doesn’t make me less spiritual or less capable or just less. I want her to tell me it’s ok to struggle. It’s ok to cry. It’s ok to have hard days. I want her to tell me that I’m doing a good job and that she’s proud of me for hanging on. If you’re doubled over in your missing, I’m so sorry. It’s ok to struggle. It’s ok to cry. It’s ok to have hard days, because we are motherless daughters, and some days that load hurts too much to carry on our own. So reach out. Don’t suffer quietly. Find someone who can help carry your grief. You don’t have to do it on your own. Oh, Kasie, I am so sorry for what you are walking through. I’m praying that God would bind up your broken heart tonight. Spending love and prayers to you, friend. I know, I’m right there with you. Susan, I know your mom would be so proud of the woman you are. I am so sorry she isn’t here to share life with. Sending lots of love and hugs. Heather, I give thanks for you and your gift of reaching out and holding those who need to hear your words. Your mother would be proud of how your words “mothere” us. Wow, what an inspiring post – THANK YOU! leukemia when I was 13), and going through many serious, scary trials since, (thankfully with my two beautiful daughters unfailing love, care & support throughout), the worst this year with hubby both mentally/physically not well and unemployed, & all suffering the grief of my dear son estranging himself from us when he married 3 years ago. Not a day goes by when I don’t miss Mum! I thank The Lord for His Grace and Faithfulness through it all! Heather your blog touched me so. Your words remind us that mother loss is a lifelong journey. Thank you for putting your thoughts into words. There are so many women out here that need to here they are not alone in their journey. This resonated with me to my core. I’ve gone 7 years now without my mom and just had my first baby three weeks ago. A part of me thought having this baby would help with the missing her as this baby is a little piece of her, but it has actually thrown me into quite a pit of grief. I eant so badly to ask her for advice and to be able to hand her my crying baby when I have tried everything to calm her, but more than anything I want to be comforted and nurtured by her like only she could. Thank you for sharing your experience, knowing I’m not alone or crazy helps a lot. Oh, sweetie, I am so sorry you are missing your mom. Having a new baby is such an emotional time filled with first and crazy hormone swings and to not have your mom around to hold the baby or ask questions or give you a hug when you are overwhelmed is really hard. You are not alone in what you are feeling. Sending you so much love and a big hug ❤️ your mom would’ve been so proud of you. The first sentence immediately caused my eyes to water and felt that punch in my chest. It’s been 20 years since my mom passed away. I was 6 years old and nobody tried to explain what was going on. I hardly talk about her because I wasn’t allowed to when I was young. Holding all this pain in for so long. I miss her so much, especially now that I’m a mother. I don’t have my mother to go to ask for guidance and comfort. Especially on those hard days. Thank you Heather for your words. My mom has been gone a year and a half. I miss her more now than ever. Life is really hard rite now. I am 55 years old, and I am a grandmother myself. But I need her. I need my mommy. Jennifer, I am so sorry that life is hard right now and that you’re missing your mom. I appreciate your vulnerability so much. You are not alone in missing your mom and in still needing her. My own mother in law (who is in her 60s) lost her mom last year and it made me realize that no matter how old you are when you lose your mother, it leaves a tremendous hole in your heart. I’m praying that the Lord would strengthen you, comfort you and bring wave after wave of joy in the midst of your heartache. Leslie, I am so sorry for the loss of your mom. I know it must be so incredibly bitter sweet to hold your sweet grand-baby knowing she shares your mother’s birthdate and name. What a precious bond Sofia will have with your mother. As she explores the house that has so many memories of your mom, perhaps you will be able to share stories and memories with her to celebrate her wonderful great grandmother <3 Sending love and hugs. Thank you for this article…I just lost my Mother, my best friend and prayer partner…as much as I am overjoyed that she is with our Savior after having lived through much trials from her start to her end, I miss her desperately…and when I think of all the life I have left to live without her physical presence, it makes me nervous. I’ve survived the most difficult of circumstances with and because of her. I can’t fathom it. However I know the Lord is faithful…thanks for your voice and experience….it helps and comforts. Oh, Chloe. I am so sorry for the loss of your mom. I understand the ache and anxiety of wondering how on earth you’ll be able to keep living your life without the prayers, deep faith and support of your mom. God will pour out grace upon grace for each moment. The faith that she instilled in you will be your anchor. I’m praying that God would pour out his comfort on you tonight and in the days ahead. Thank you so much for posting. As a mom that was very encouraging. My mom has been fading for years and this may be the week that she passes. It’s a very sad time, and I know that every stage God has blessed me with a beautiful purpose in her life. She was always there for me and now I’m thankful that I could be there for her. I have been grieving for years and I know this week will be difficult. Thank you for your ministry as I’m sure I will be blessed by it in years to come. Oh, Julie. I am so sorry. Watching your mom slowly fade and diminish before your eyes is so painful. I’m praying for you during this very hard week that the Lord would be close, that his Holy Spirit would pour our comfort in you, your mom and your entire family. Thank you so much for this post. It’s only been since August 2018 that I lost my mom. She had been through so much pain and health issues she finally gave up. I’m still in shock. I struggle everyday and feel so alone. Her birthday was April 6th. She won’t be here for my 50th birthday or see my daughters beautiful dress for prom. She won’t be here for the graduation of my daughter just so many things. I feel the biggest hole in my heart. I am so sorry your are struggling. Losing your mom is so very hard and you are not alone in your suffering. It’s bittersweet to look forward to those special days knowing you can’t share them with your mom. Praying you would feel her presence all around you this Spring as you celebrate these milestones with your daughter.